This hostel made my experience in Lagos. It’s central to everything, clean bathrooms, comfy beds and blankets, safe, great atmosphere, and the staff are incredible. Both Catalina and Igor were so sweet and helpful and it felt like being part of a family. It’s a calm, laid back, and relaxed hostel so you can really make it what you want. If you want to make friends, you can, if you want to do your own thing it’s easy. I only left because I had to, otherwise I wouldn’t have! 10/10! 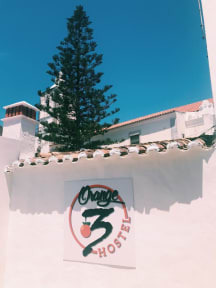 One of the best hostels I visited in Algarve :) Location is very comfortable, close to the coast and central streets. For the parking you have to walk a bit, but there are a lot of big free parking areas nearby. The stuff was very friendly and ready to reply on any kind of requests. 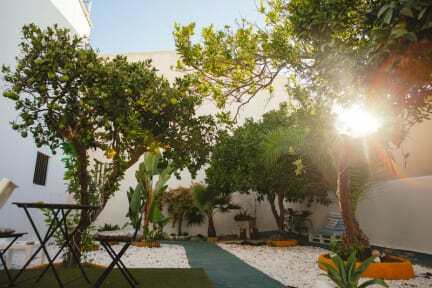 The small garden inside makes an atmosphere more cozy for breakfast and evening chill out. Definitely recommend. Our stay was good and the staff were excellent. We were treated exactly the same as all others despite the fact we are both seniors. We would gladly recommend you to our relatives in USA, Canada. Scotland and Australia. The place was well run and had a family atmosphere. Highly recommended. My husband and I stayed in the double room with private ensuite. This hostel has a great vibe with lots of cool common areas. The hostel is very clean and in a great location just a few minutes away from the main streets with restaurants, bars, and shops. Only stayed one night, but the room was great, everything was very clean, breakfast was good and staff was very nice and helpful. The garden outside is really nice, I made some dinner and sat outside to eat and it was great. Solid place to stay. Cute courtyard. Catarina and the other staff were lovely and very helpful. It was very quiet due to the time of year (probably due to it not being peak season) so was good for a relaxing stay. I was able to walk right into the building and even my room without presenting a card or combination or key. Rooms were quite tiny with little room for your bag. Staff weren’t very friendly. Offered laundry services but only to wash your clothes, you were responsible for drying them yourself, and only outside. Outdoor terrace was quite nice. But no vibe or atmosphere. Given the money, I wouldn’t come back again. There was no atmosphere at all. No where to sit except outside. The "living room" upstairs was small. The breakfast was okay. During off season, the reception is open only for when people say they're arriving. I missed my earlier bus and had no way of contacting them. I only got in because another girl also missed her bus. The rooms are damp. The beds are comfortable though and there are curtains and lockers. Some lockers are broken latch and it's bring your own lock.